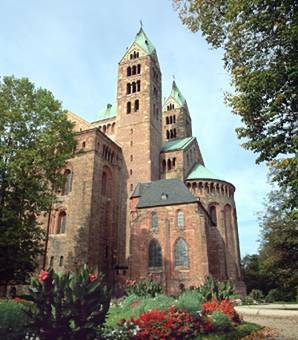 The imperial Speyer cathedral with four towers and two domes, is one of the most significant Romanesque monuments in Germany, and it was the largest building of its age. Its architectural structure strikes a perfect balance between eastern and western influences. Construction started in 1030 under the Salic Emperor Conrad II, it was consecrated in 1061 and became the royal burial place for around 300 years.